Mercedes SLK | What Car? Early buyers of the new-look SLK only have to wait until March to get their hands on the car, but while it undoubtedly remains a head-turner, it is the modifications under the bonnet rather than the slight bodywork tweaks that are of major significance. Most significantly, this concerns the petrol engine line-up, which features three less-polluting units, two of which also have extra power. The supercharged 1.8-litre engine has been boosted by 20bhp to 182bhp, with emissions figures lowered by 27g/km to 182g/km. It is only available with a manual gearbox. The 3.0-litre unit remains at 228bhp, but has emissions 11g/km lower than before with a manual gearbox, at 220g/km. With an automatic gearbox, it emits 216g/km, 6g less than before. Although the new 3.5-litre V6 engine is the same size as the unit it replaces, it has 301bhp, 31bhp more than its predecessor. Emissions with the automatic gearbox drop by 23g/km to 219g/km. With the manual gearbox emissions are 227g/km, a fall of 28g/km. The 357bhp 5.5-litre V8 range-topper remains unchanged. Revisions to the exterior include a new nose, which has been shaped to resemble a McLaren-Mercedes Formula 1 car. Other changes include a new grille, bumper, lights and mirrors. The interior has a new steering wheel, revised instruments and upgraded entertainment and information systems. 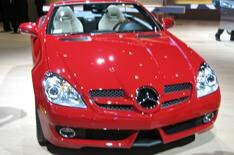 The revised SLK should cost from 29,000.